Alvin coordinators, swimmers on Alvin, and pilot of Avon in a morning deployment. Our dive series with Alvin consisted of 13-days, 13-dives, no days off! 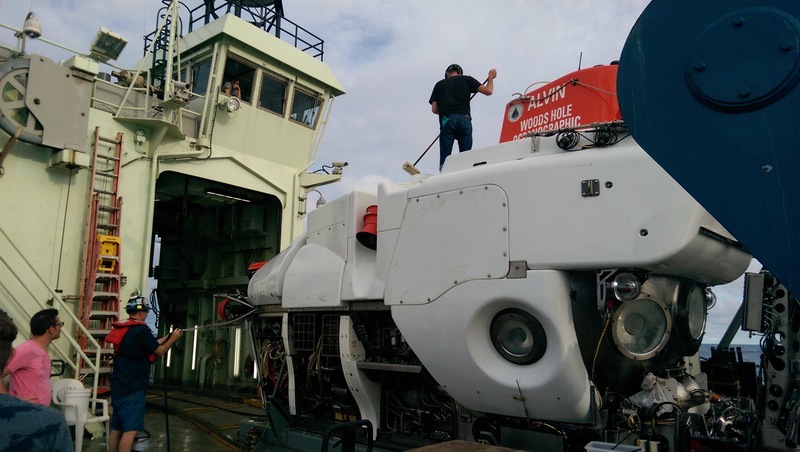 The daily launch of Alvin (and recovery) provides a rhythm and flow to the cruise that is unique among oceanographic cruises and something very special about Alvin cruises. I find the whole routine comforting and adrenaline pumping, making me want to jump out of bed in the morning regardless of how little sleep the night before working. Alvin getting a scrub down after its last dive of the series, showing Alvin’s hangar and the Doghouse above. 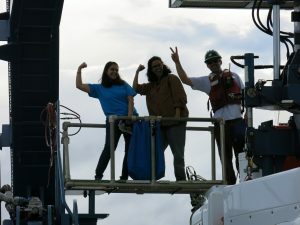 Alvin deployments are the ultimate example of teamwork between the crew of the ship and Alvin team, involving individuals or teams of 2-4 people. The teams each have their names: the Bridge, Doghouse, Alvin coordinator, and Avon. The Bridge oversees operations, Doghouse runs the A-frame that lowers Alvin into the water, Alvin coordinator is on deck with Alvin, and Avon consists of crew that deploys and operates the 18-foot zodiac boat that picks up two swimmers, who ride along on the outside of Alvin as it is lowered into the sea, releasing the giant rope holding Alvin to the A-frame. Once Alvin is in the water, the swimmers put the finishing touches on Alvin for the dive, releasing Alvin’s arms and thrusters. Hearing all four teams over the radio when in the sub for a dive is one of the many welcome routines that I’ve grown accustom to during my four dives on this cruise. The team members’ rotate positions, so that someone new is doing a particular job on any given day. Every deployment is run like it is the only deployment that matters, with crew and Alvin team being extremely vigilant and careful, running through their checks so that deployments go smoothly and safely. 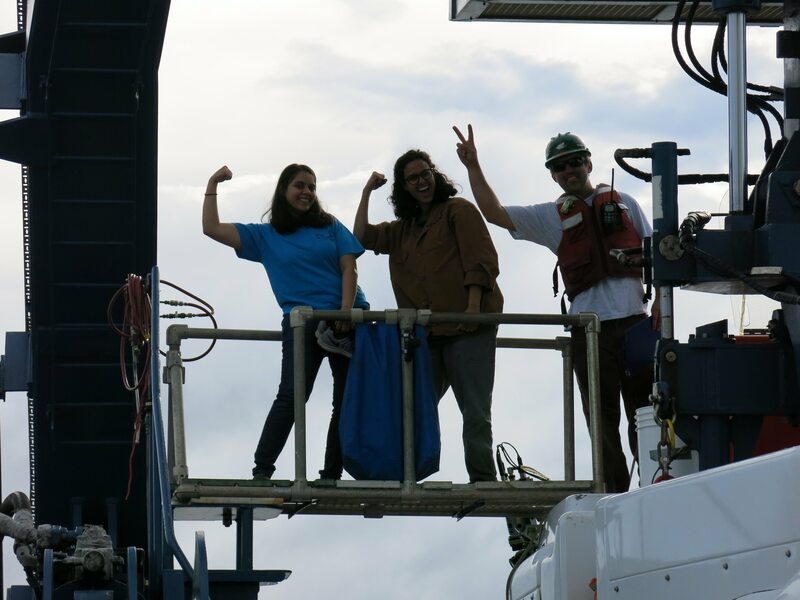 Alvin coordinator Josh Sisson with scientists Sushmita Patwardhan (left) and Ileana Perez Rodriguez after a successful dive. The crew and Alvin team make everything look seamless. 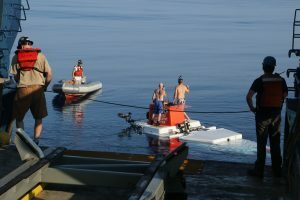 Us scientist have the thrill and honor to watch this daily routine play out over and over again during the dive series. We really appreciate all the hard work of the crew and Alvin team in deploying not only Alvin but in many other important jobs on the ship. Sunrises are part of my morning routine on Alvin dive days. 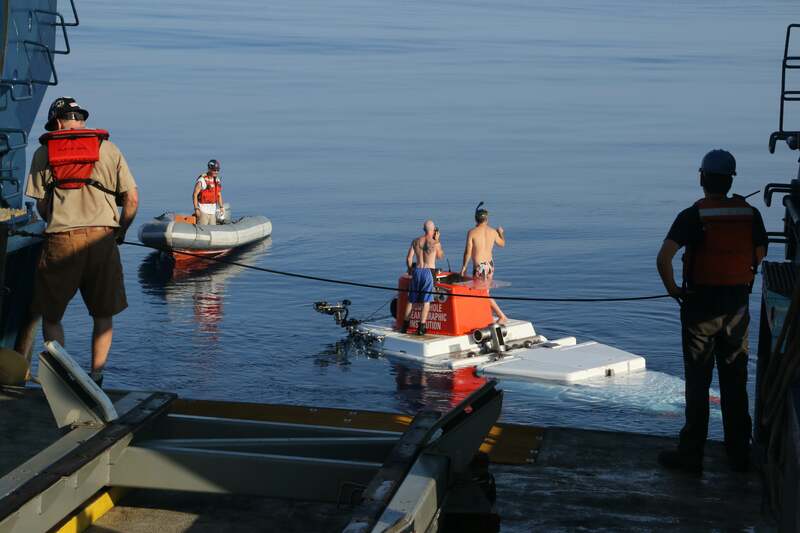 I naturally fell into this routine on my last Alvin cruise at 9˚N in 2014. 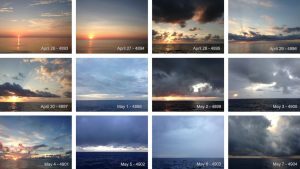 On this cruise, I made a point of catching every sunrise on each day of our 13 dive series. For me catching the sunrise is an important part of my routine, giving me a moment to contemplate the excitement of the day to come and marvel at the endless horizon and raw beauty of the ocean. There is a sense of wonder, of sky, intense color, and blue water that is unique to being so far from land. We are in the middle of nowhere at 9˚N, with not a single airplane, contrail, or any other vessel in site during our dive series. All the troubles in the news media are far away. Our focus is on the moment, taking in the beauty of the ocean in between long hours of work and focus on our research objectives. After sunrise, there is breakfast and then wishing our colleagues good luck and happy farewells as they embark on their trip to the seafloor. And of course watching the awesome crew and Alvin team at work as they launch Alvin! Sunrises during our dive series, with date and dive number corresponding to each day of the series. Our 13th dive (4905) on May 8 is not shown.